For any organization, paying tribute to 100 years of history can seem a daunting task. 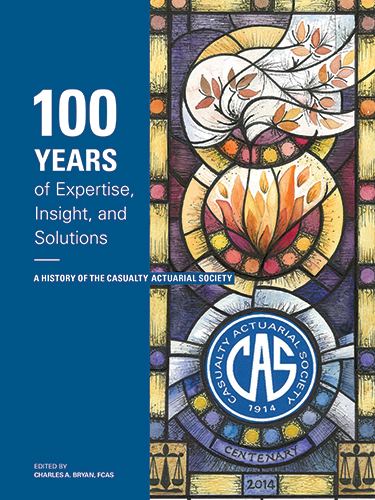 It will come as no surprise that the celebration of the CAS’s centennial year – culminating in the CAS Centennial Celebration and Annual Meeting in New York in November – was decades in the making. Projects such as the CAS Centennial History Book and the CAS Centennial Celebration Website involved years of hard work by dedicated Centennial Committees, planning everything from event music to on-site special projects. The CAS Wall of Names, a 40’x8’ banner displayed at the Centennial Celebration that listed every person who has ever earned CAS credentials. A Centennial Video that highlights milestones from 100 years of the CAS, including testimonials from the CAS’s oldest living member. The CAS Centennial Museum, which housed artifacts and exhibits from pivotal moments in CAS history. A commemorative CAS Centennial History Book featuring historical photos and personal recollections from CAS members. The standalone CAS Centennial Celebration website, which featured an interactive Centennial timeline that included milestones from CAS history, a Centennial news ticker and a photo/video gallery. On June 15, Association Media & Publishing recognized the CAS Centennial projects for excellence in marketing and communications with two coveted EXCEL Awards. Competing against 850 other entries, the CAS received a silver award in the category of “General Excellence in Web Publishing (Event/Convention)” for the CAS Centennial Celebration Website, and a bronze award in the category of “Integrated Mixed-Media Campaign” for “Celebrating the CAS Centennial,” a campaign that included the History Book, Wall of Names, Centennial Video and CAS Museum. Although receiving these honors is validating for everyone that worked on the projects, we encourage you to take a look at the outstanding projects created by your fellow CAS members. You can download the free Centennial History Book, find your name on the Wall of Names, or watch the Centennial Video and other interviews with CAS pioneers. To be part of an organization celebrating 100 years of history means that for many, this celebration was truly once in a lifetime. For more information about CAS recognition at the EXCEL Awards, visit our press page. Kate Niswander is the marketing and communications manager at the Casualty Actuarial Society. Posted in CAS Centennial, Communications, Volunteerism and tagged CAS, Casualty Actuarial Society, Centennial, Communication, EXCEL Awards. Congratulations to the CAS Staff and Volunteers who worked so hard to make the Centennial Celebration a great event. It was fun to see CAS members enjoying the Centennial projects. Those of you who knew Frank Harwayne. Charles Hewitt and Bill Wieder may enjoy the long version of the interviews with these CAS Pioneers which are available on the Centennial website. For those members who were unable to attend the Centennial in person, I encourage you to take a virtual tour of the celebration on the Centennial Website where you can see historical photos and video, view the timeline of CAS Milestones and find your name on the Centennial Wall. You can also download the CAS Centennial History Book or purchase a hard copy from the CAS Store.